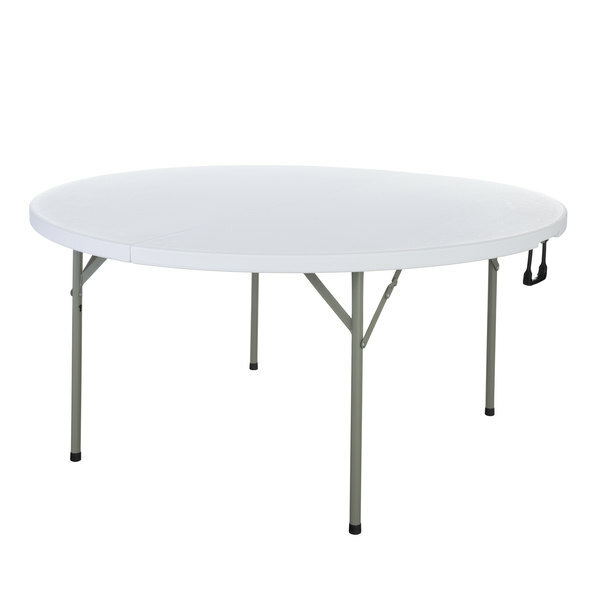 60" Round 48" Round 30" x 72"
Featuring a space-saving, bi-fold design, complete with carry handle, this Lancaster Table & Seating 60" round heavy-duty granite white plastic bi-folding table gives you exceptional versatility at a price that's hard to beat! This table is perfect for both indoor and outdoor use. It offers an ample 60" diameter and classic granite white surface when in use, yet is easy to carry at the end of an event. Simply collapse the legs, then fold the table in half. It will lock together for safe, efficient storage and transport. Carry by the handle or place on a dolly. Unlock, unfold, and expand the legs when ready for your next engagement. With a high-impact polyethylene construction, it's guaranteed not to crack, chip, or peel as a result of routine use. It is stronger and more durable than wood, and easy to clean as well! This table is a fantastic choice at any number of catered events in virtually any setting, such as dining rooms, kitchens, offices, conference rooms, restaurants, banquet halls, and more. The sturdy powder-coated steel frame boasts 19 gauge steel legs and a 1 3/4" thick granite-colored top for a table that is as durable as it is attractive. Caps on the end of the legs help protect floors from scuffing. Perfect for large gatherings or parties, the table easily folds up for a compact, lightweight asset that is a breeze to transport and store!